Dr. Roy was is extremely knowledgeable and through. He shows great care and pride in his work and makes you, thepatient, comfortable in his care. Highly recommend. I've seen Dr. Roy multiple times, this is the first using ZocDoc, and he's always great. Anyone looking for a providerwould be lucky to have him. I've seen Dr. Roy multiple times, this is the first using ZocDoc, and he's always great. Anyone looking for a provider would be lucky to have him. Dr. Roy is a native New Yorker who spent much of his life growing up in Queens NY. He completed his preliminary education in Astoria, Queens before he attended college in Adelphi University in Garden City, NY and earned a Bachelor’s in science. Dr. Roy continued his studies in Adelphi University while working in the Chemistry Department and earned his Master’s in science to further his education. 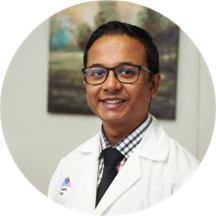 With a strong family background in medicine, Dr. Roy has always had his heart set towards patient care and decided to follow his vision in the field of Podiatry. He attended the New York College of Podiatric Medicine in New York where he earned his medical degree as a Doctor of Podiatric Medicine. Dr. Roy continued his surgical education in the prestigious Mount Sinai Hospital where he earned his degree as a resident in Podiatric Reconstructive foot and ankle surgery. Dr. Roy was also elected as one of the chief residents in his final year in training where he managed a large group of 22 podiatric residents in the program alongside his director. Dr. Roy has worked in several New York hospitals and has treated a spectrum of pathologies seen in the foot and ankle. He has a strong surgical background and is devoted to use his skills to aid those in need. At DeLoor Podiatry the vision is to provide the most cutting edge lower extremity treatment to our patients regardless of insurance status. Our mission is to preserve New Yorkers' walking strength. At DeLoor Podiatry we use the most advanced laser scanning and digital scanning technology for evaluation of pedal pathology. Our practice offers the best foot and ankle imaging with our inpractice MRI, CT scan and musculoskeletal ultrasonography. The physiotherapy section offers transcutaneous electrical nerve stimulation. Dr. Roy is a very smart and caring individual, however DeLoor Podiatry as a whole is really unorganized. When I set up my appointment via ZocDoc, I got calls from two separate people from two separate offices stating that my appointmentneeded to be moved, yet neither of them knew the other office contacted me. And then on the day of my appointment I had to reschedule for an earlier time, but I apparently called the wrong office, as the office I went to was unaware. As a result I wound up waiting for 45 minutes, overall the organization needs to be run more smoothly. The office was very profession. Dr. Roy explained everything to me thoroughly. I was disappointed that they refused to do any procedures to fix the problem and only prescribed antibiotics. They then wanted me to come back for a second visit. I have never had that happen before. He was great at explaining the diagnosis and treatment. Really dishonest about timeline of getting results of x-ray, CT scans, etc. X-ray machine in office did not work. Had to wait ages to see doctor. Uses service to deliver prescriptions which does not follow up promptly- somehow I am stillwaiting to be contacted by them... Whole experience was a nightmare. I've never dealt with such an unprofessional office. Very informative and excellent bedside manner. I would definitely see this doctor again. Great overview and explanation of my issue, as well as a clear step by step plan to treat it. Today i had a wonderful visit with Dr. Loor as he was very insightful and answered all my questions. Thank you for your help! I saw Dr. Jones. Dr. Jones was very professional; explained my injury, treatments and objectives. I was very pleased with Dr. Jones. However, I regret the fact I did not find Dr. Roy's office a month ago.Finally after meeting with Dr.Jones, I know what options are available to me and we can move forward with treatment and recovery. Thank you Dr. Jones.